sized ), dry red chillis ( 2-3 nos. ), roasted cumin-chilli powder ( 1/3 tsp ), turmeric ( 2-3 pinch ), salt to taste, vegetable oil ( 3-4 tsp ), pancha phutana ( 1/5 tsp ). Preparation: Wash and cut the onion flower stalks into inch sized pieces. Wash and cut the potato into small pieces so that both vegetables can cook togather. Cooking: Heat a non-stick pan. Drizzle a little oil. Turn the flame to high. Add the broken red chillis and pancha-phutana. Allow seeds to crackle. covered for 8-10 mins. Stir occasionally so that the vegetables do not stick to the pan. Sprinkle the chilli-cumin powder, mix well and remove from the stove. This goes very well with chapatis ...lovely recipe! 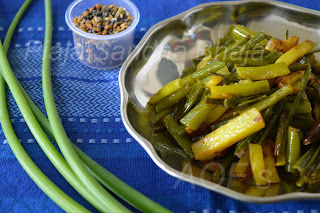 I had seen onion stalks in the market, but I was wondering about the recipe. Now that I have got your recipe, I will definitely try this recipe. Thank you for the wonderful post.